At the western edge of Europe and of Islamic expansion, the Reconquista in Spain was well underway by the eleventh century; it was intermittently ideological, as evidenced by the Epitome Ovetense written at the behest of Alfonso III of Asturias in 881, but it was not a proto-crusade. Increasingly in the eleventh century foreign knights, mostly from France, visited Spain to assist the Christians in their efforts. Shortly before the First Crusade, Pope Urban II had encouraged Spanish Christians to reconquer Tarragona, near Barcelona, using much of the same symbolism and rhetoric that was later used to preach the crusade. 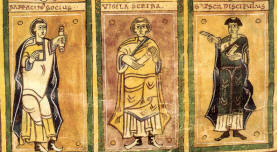 The Codex Vigilanus (Albeldensis) or Códice Albeldense (Vigilano), full name Codex Conciliorum Albeldensis seu Vigilanus, is an illuminated compilation of various historical documents from the Visigothic period in Spain. Among the many texts brought together by the compilers are the canons of the Councils of Toledo, the Liber Iudiciorum, the decrees of some early popes and other patristic writings, historical narratives (such as the Crónica Albeldense and a life of Mohammed), various other pieces of civil and canon law, and a calendar.